Funding pasahe and baon for kids via cyberspace, possible? WHAT would a child do if he has money for fare to get to school but nothing for food, or has a meal allowance but would have to walk two hours through dirt roads, singling along highway sides—a choice that, either way, cancels the possibility to be in school, doesn’t it? Yet, children in countless Philippines rural towns apparently anguish over this dilemma every day. If some make it to school with what their parents could scrape for fare, they would be drowsing, known to pair with hunger, by midafternoon; most simply drop out as has been commonly reported. I suppose those who recognize that such a problem has long existed would find comfort on learning that this, too, rears its ugly head, though in another guise, in American schools, where the state, under the National School Lunch Program subsidized by the federal government, provides food either for free, at reduced prices, or paid in full, depending on parents’ income. The program, started in 1946, has since served 224 billion lunches and cost $11.6 billion in 2012; its implementation, though, has not only differed per school charter but also among states, causing a few controversies. The practice of stamping or marking out a child who gets lunch for free or whose account had run low, hence embarrassing him or her, had led to the alleged firing of Noelle Roni, a former principal in Peak to Peak, Colorado, as recently reported in The Huffington Post. On the other hand, commiserating with his classmates who had been shamed by the practice has inspired Cayden Taipulus, a 3rd Grader, “to launch a fund-raiser online and collected nearly $11,000 enough to buy his classmates lunch for the rest of the year” through a social-networking site and posted on Facebook a few weeks ago. No basis of linking the topic to Filipino schoolchildren who have nary a hint that free lunch could be possible, right? Wrong. I do know of an initiative, though hardly resembling the US program—its funds, for one, to provide what parents can’t ever afford to send their children to school can take in only four students per class year from Grade 7 to fourth-year high school. Not of an organization but an informal alumni group of Bacarra National Comprehensive High School (BNCHS) in Ilocos Norte, nothing about it sounds like something already known to have rooted, even if still quite fragile, so far. Iliw, its name, a fanciful acronym for a quixotic dream on Innovative Learning Initiatives and Ways for Bacarra, in truth, describes a sentiment its members on a Yahoo! group site Tony Ponce owns that fired them to set up the sponsorship. In Iluko, iliw not only means nostalgia, it could also conjure up gestures that burst with longing, which, in this case, happened on cyberspace and not just for a night but nightly for about a year. So gripping had the memory-swapping affected the otherwise amorphous camp of alumni from varied class years, at first merely exchanging patchy messages about reunions, that when an author joined with a book on collective memories of their town in mind, Tony’s site soon swarmed with “raucous regulars,” tossing in what they recalled, unraveling years in Bacarra long misted by exile. From corners on syncopated time zones in the US and Canada, some in Europe, a few in the Middle East and in the Philippines, the virtual friends “prowled” Bacarra’s streets, “talking” of the same everything; they even discovered blood kinship among them, charted the town’s map by memory, though possibly extant by now, and revived their tongue by then lost in their alien lives with lessons in Iluko 101 that Rufino Tangonan, a math teacher in Texas, started with word-meaning quizzes. But life eventually began to creep on their idyll on cyberspace—if one of them had not gone home and driven by memories dropped by BNCHS, bringing back to the group a poignant picture of some students trudging miles or hungry in school, the group could have just thinned out into air. But their boldness held up and birthed Iliw ti Bacarra, a sponsorship they funded with disparate amounts out of their pockets, wired to a PNB account in Laoag City and disbursed by an officer to the school. While the book that triggered memories remains cached, and most Iliw members now at least have “met” on Facebook, the third batch of graduates finished this year with two of them from the Special Science Class (not a scholarship, Iliw expects only passing average but most of all, the will to graduate). As upperclassmen in the program will be assessed, about 30 would soon be gathered again to be screened at the BNCHS library—Victoria Albano, not an alumna but a Bacarrena in Vancouver and donor, nonetheless, prays for those not chosen. Would they face each day without pasahe or baon like perhaps thousands somewhere in the islands? I know this sounds old news oft-repeated, so much so that instead of drawing compassion the image invites indifference. Or how else could one explain the yawning gap in schooling between over-privileged and more-than-poor Filipino children? Maybe we could all storm the heavens for a duplication of Iliw or for more to hop in on it. Built or erected in marble or stone, though some cast in metal, as landmarks in a country’s history or reminders of heroic deeds, monuments are so aimed at permanence or impregnability that for it to crumble one day hardly sound possible. 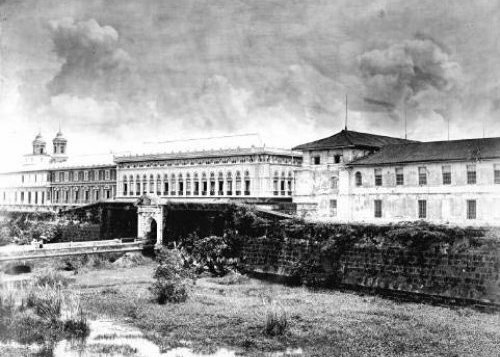 From what I learned from a restoration architect, my late husband Felix N. Imperial II, who studied the art at Escuela Superior de Arquitectura de Madrid, and came home with quixotic dreams to apply what he had learned in Intramuros, keeping monuments intact requires more than stone masons, brick layers and other such hands (because it is as much a handiwork as building them), it asks of governments a political will—monuments belong to a nation, after all. Indeed, a great number of such buildings or structures have defied decay from both centuries of natural and manmade disasters like tropical weather and wars such as San Agustin Church but especially elsewhere, those well-kept palaces and temples we often dream of walking into, if only to experience a moment of greatness or a glorious past that for many of us exists only in ether. Virtually a young city of 140 years, I see no such buildings here in Vancouver the likes of Philippine colonial structures most of them sadly left for time to eat away. But why must a country like the Philippines struggling to stave poverty feed its past of non-living things? Answers to this all too common question with what seems obvious can drag into either despair or acrimony those who belong to the many sides of upholding or not patrimony. Such complex imbalance of forces to Felix had first, scaled down then later, hazed his dream: Intramuros would have given the Philippines a niche with the only medieval walled city in Asia among nations who showcase an inimitable past. Except for the four gates, major parts of the walls, and the esplanade at Parian, a few of which he restored from the ground like Puerta Santa Lucia, most of his dream—if but one of the palaces, the Ayuntamiento, would have risen again—like moth wings slowly powdered and blown away. He died though, realizing how tiny a vessel man’s body to bear his dreams. I think Felix was luckier in that he found closure and acceptance, in contrast to my paternal great grandfather who had built not a national monument but a personal one, which I suppose most families would recognize, “for his heirs”. Of these, there are several in Vancouver, most of them exquisitely cared for as living museums—one of them, the Colbourne House still breathing right across our gate. My great grandfather’s house was of brick and mortar townsfolk of Bacarra called, kabite; its frame had been all I grew up with, a hulking shadow right across from our then fragile wood and bamboo house; apparently its interior was burnt. While almost a myth to Santiago, a nephew my age, and me, as adults we dwelt on snippets of what sounded like tall tales about it. Such as: a short bridge spanning a narrow moat, circling the house, washing the base of a fat rectangle of what we heard were stables, and dark wooden doors and windows that would open at midmorning to the camino real. As Santiago and I sometimes sat on ruined steps of what we thought must be a grand staircase, we imagined a giant chandelier flooding a hall. Long dining tables like those stacked up under the creaky house we lived in must have been set on those monogrammed linens I once found in my grandmother’s trunk. Guests must have taken their liqueur from those Depression shot glasses, which we thought were toys in the buffet shelf of Santiago’s mom. He and I hardly met during our university years in Manila. Not even when a court case stirred enmity in our families in a fight over yet another property, the land where our house stood—we had since lost the one where the kabite stood through another heir. Two decades later, poring over a heritage book about our town, we closed the pages miffed at nary a word about it. In photo: Puerta Santa Lucia facing the bay was totally ruined in WWII when a tank rammed into it; it was restored from the ground up by restoration architect Felix N. Imperial II, using traditional techniques of merely fitting the stones and without any reinforcing bars. He restored all four gates of the Walls. Where I was born, a town the shape of a mallet in the Ilocos provinces that hug the northernmost edge of the Philippine archipelago, sky, landscape and things that breathe appeared lush, wild and poignant all at once. Wedged between a ferocious river, which ate up chunks of earth when it swelled, and a pastoral spread, which yielded rice, garlic, onions and tobacco, Bacarra—after a fish—that is its uncanny name, seemed charmed. Or so I remember as I trace my childhood in roads laid out in a grid, marking out memories, making landmarks out of them. The horrendous WWII had just ended and the Philippines just gained independence from the US: we were dubbed ‘Liberation Babies’. Life wove in and around our families, neighbors and schools, in rituals, routines and events set against rambling landscapes. Wildwoods fringed our playgrounds and schools. Nights and moonlights came as they should. We studied in the gas light; we played under full moons. Such moments have not ceased to haunt me. Fifty years after my family left town, their spell still grips me especially those last years, my high school years. I had just stepped off childhood and in to transitory teenage-hood, those rainbow-bright years. My story is about those years. A kilometer stretch from our house to school posed quite an ordeal for me during my freshman year in Bacarra High, the public secondary school. We had just moved west to live with my maternal grandmother in a house close to the rice fields, leaving my paternal grandfather’s estate central east along the camino real within sight of the school’s eastern boundary. Emptied, our house had to be torn down; I watched it as our tenant-farmers took it apart, plank by plank and beam by beam. Mama had to send my grandfather’s tinted crystals to a cousin for safekeeping. The rag dolls I sewed button eyes on I had to box and give up for space. 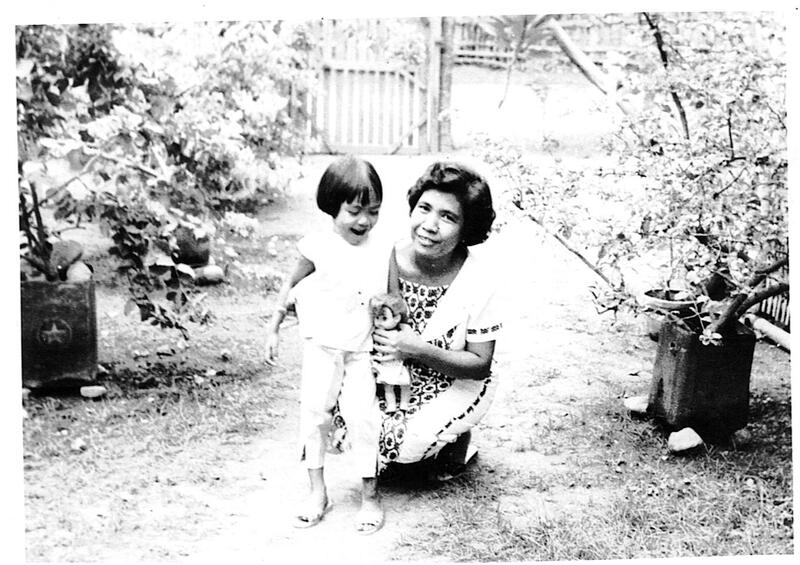 Across our gate under the shadow of her father-in-law’s ruined stone house, my grandmother rocked softly in her wicker chair, waiting for the only bus trip to Manila. Her butterfly sleeves sagged on her white shoulders; her peppered chignon left wisps on her nape that flailed in the breeze. Uprooted from everything she had ever known, Capitana Canra looked forlorn— capitana being a sobriquet she gained, like all others did as wife of the presidente municipal, called capitan, during the Philippine Commonwealth Government of Governor General Leonard Wood’s time. As Mama and I walked toward the sunset, I too, felt like dying especially when we reached the house of the Aligas—children of a doctor and a nurse, who met at the American-established University of the Philippines. Here, I spent most of my growing up years tussling at play and even eating meals with seven of them, swapping school anecdotes on the dining table. At times, we went ‘back-riding’ in the doctor’s Oldsmobile when he drove to Laoag (the capital town) ten minutes away to play tennis or made house calls in the barrios. 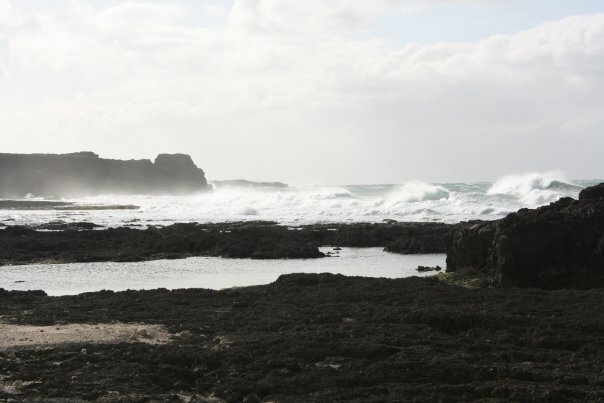 Once, we slipped through the car windows and dipped in a shallow stream, dripping from hair strands to clothes hem when Dr. Aliga rounded us back to the car. We had endless rounds on the Chickering piano or on the swing, and turns tearing off pages from their mom’s Home and Garden, Good Housekeeping and Saturday Evening Post issues. I, too, teetered as a patient in the ground floor clinic where either doctor or his wife treated my bruises, relieved me of allergies, or gave me anti-rabies shots; I was often dog-bitten, picking gardenias. When I wasn’t with the Aligas, I would have walked to or been fetched by a maid of the Albano-Pilars; their father was town judge, their mother my elderly cousin on my father’s side. We played games of make-believe and staged our own version of Ziegfried Follies on the bed to their mother’s horror: what if we tumbled off throwing a leg, and broke a bone? Some evenings, as if we sat in a music hall, we listened to impromptu Chopin concerts by another cousin when her family came down from Baguio, the American-built summer city in the Cordilleras. If we didn’t move west, going to school would be for me a breezy walk past homes and grounds I knew blindfolded. Right off our creaky gate, I would sashay to the corner looking across Lola Nena’s house. It sprawled amid a fruit yard of mango, star apple, and chico trees—so old they had branches splayed close to the ground; I used to haunt them like a leprechaun. A few paces on and I would be peeking into a granary curious about treasures hidden only to find sacks of un-husked rice that brooded like petulant giants. Close to the granary would be the house of their grandfather on a lot the Aligas and their other cousins shared. Both houses opened through a driveway that the ‘sour-drop’ tree (karmay) shaded—it bore fruit we coveted like birds, tiny coronet-like clusters with yellow crunchy flesh—and tucked to a corner, a wooden swing over which we tangled for turns. Once on the other side of the street, I would be peering at the mansanitas (golden lemon minute apples) we hardly let ripen. We would pick them, imagining callow suns in our palms; this wild tree grew sweetly close to the kitchen window of the Vers—yet another playground. 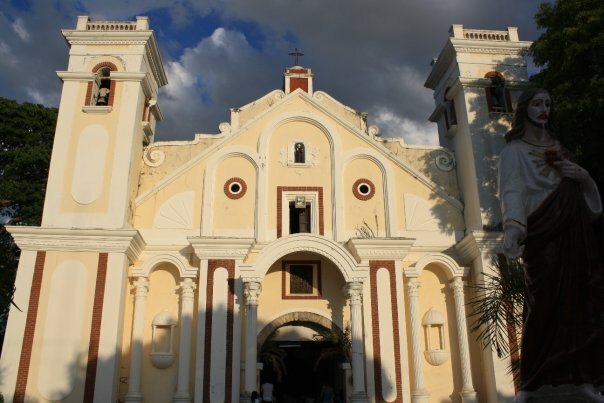 After this first block, I would stride past the Philippine Independent Church, and then come to the imposing two-story house of the chief of police, also an Albano relative. There often sat an old uncle by its wide capiz (shell of the gloria maris) windows—a retired priest who often raised a right hand to bless me. Across from it stood the Protestant Church which a weathered picket fence set off and clumps of bird-of-paradise curtained. I would take the gravel road bounding its western side, passing by a bakery, eye scrunched and nose pinched so I could resist the lure of sugar-topped, margarine-heaped ensaymada buns. This unpaved stretch ran alongside the fenced-in wild woods at the ruined rear end of the centuries-old Catholic Church. If I could but scramble through a wire fence visible from the windows of the classroom building, I would be seated sooner in class. But as it happened with our move west, I had to trudge a kilometer span of asphalt road and some gravel four times a day, including going home for lunch, then back again. First, I had to shamble through the dirt road from our house, passing by homes of Mama’s kin. This short span ended in between shades of giant breadfruit and acacia trees and the artesian well in front of the house of Lola Sepa, nurse-midwife, who seemed to cause babies to get born on her routes. From here, the asphalted main road began: a singed black ribbon that unfurled on my steps. Soon, it would wind past the walls of Lola Loren’s house. I often paused right off its gate by a stream, which was really an irrigation canal, to breathe in some fresh wind or listen to bamboo trees hiss and groan. If she sensed me prowling, Lola Loren would bring me a glass of fresh sugar cane juice or a bowl of peeled pomelo slices. In a few yards, I would be gaping at Lolo Pidel’s gabled attic, looming over giant fronds of China beetle nut palm trees. Once, I spotted two boys picking from a bunch of ripe nuts: I liked those sweetish nuts. Creeping by the fence, I yelled and sent them scrambling down and out through the back fence, leaving only unripe green nuts on the tree. Lolo Pidel could have been napping; he was by then, retired from teaching the long division and addition. The house of the mayor would be visible shortly and across from it diagonally, Silver Theater (named after the chemical symbol from his initials, AG, Antonio Guillermo)—the town’s movie house. In its fragile darkness, I watched ‘Silver’ of those early Westerns gallop as if coming off screen, trampling on me. Faces turned grotesque at times, when a wind escaped through seams on the walls and caused the screen to heave. 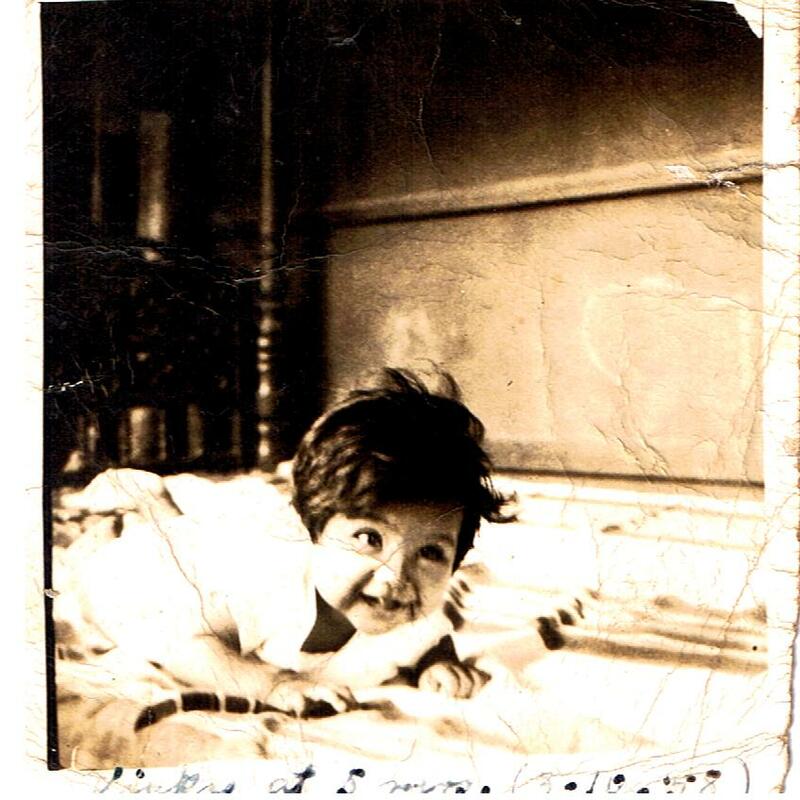 During most of Papa’s home visits from Manila where he worked, he would be Tata Gil’s frequent guest; sometimes we dined with his family and feasted on a special dish—sliced medium rare beef dressed with minced ginger and onions, ground pepper, and digestive juices, strained and blended with Ilocano black vinegar. About the same time, the Laxamanas from San Fernando, La Union would also be visiting—Tata Irineo was married to an aunt, a cousin of Tata Gil. A few steps ahead to my left behind hibiscus shrubs and horseradish trees, was Tata Milio’s house, still another Albano uncle and later, my English literature teacher. On the next block would be Dr. Bonifacia Albano’s Bacarra Clinic. I used to be shuffled here quaking from high fevers for quinine shots or some other bronchial infections she had treated me that, as stories about me unraveled, began some days after my birth which she assisted. And then, the landscape spanned out —a square composed of the plaza, public theater, municipal hall, and the Gabaldon Elementary School, which the fractured tower and baroque church clinched. The tower, once the tallest in the country, fell to its knees by degrees from earthquakes. I always shrank into a dwarf once I slipped into this broad embrace. School was far from near. I had yet to go past the East Central School, the Puericulture Center and on a clearing under the tower’s shadow, the tienda where three spoonfuls of seeded-plantain or green papaya pickled in black vinegar can be had in a banana-leaf cone for a nickel. The pickles in clear glass tubs lined on a ledge so tempted me always I had to wheeze past. I had to speed through the shade of what seemed a commonplace tree, holding hard my breath to avoid the stench of its blossoms. 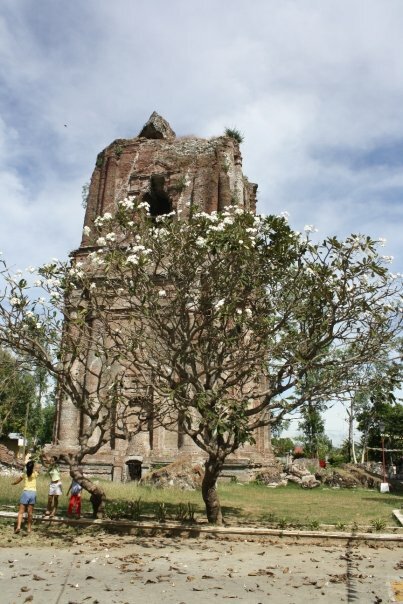 This bangar tree between the crumbling walls and base of the tower had a crown said to look like witches’ wings at night, when spirits it harbored were also known to transmogrify. With my back to it, I would be passing by the church gate. Across the street, banana trees crackled in the heat, their hearts peeling prematurely. Next to them sat the only photo studio in town, which I hardly glanced at, or I would rather dash in and scan old portraits than track the rest of the distance along the vine-humped church wall that ended where the road slid into Bacarra High grounds. One humid noon on my way back from lunch, I darted for some shade under the acacia tree fronting the public theater. Usually deserted at this time, a small crowd milled about while on stage, figures shuffled reciting lines; I had walked into a comedya rehearsal (a medieval mock battle wherein costumed characters said their lines in sing-song and danced their fights). I stayed through a scene where a listless prince detained in some mysterious kingdom by his rival for the hand of the princess begged his jailer for water, a ruse to escape. Naturally, I lost track of time. It never got better for me in that class, even after Mama had me noon-board with the Aligas so I could get to this first period on time and more so, to absorb their diligence—all siblings finished top of the class. But nothing it seemed helped; I had to face the inevitable—a final grade of 78. I wakened to a confused household that morning: the hens cackled so because Inay (Tagalog for mother which is what I called my maternal grandmother), who failed to feed them first was ironing my Girl Scouts uniform; routines had to stop about the time Mama started having labor pains. Inay had squatted on the floor, plunging the iron she packed with live coals on my uniform, which she laid over the lid of a wooden box layers of blankets padded. Where breakfast of rice fried in garlic oil would have been served with fried egg, she told me to eat my egg with pan de sal (salted buns). Inay reminded me to take a peek at my sister before I skipped off. We, Girl Scouts, assembled in school at the softball field before we marched to the main road. The whole town had almost filled up both sides of the road by the time we took positions. I spotted a fringe of shade from a mango tree by Lola Nena’s gate, my old neighborhood, where I hustled my troop. Two hours later, our necks already stiff from gazing east, we still could not make out any sign of the president. We had started soaking in our sweat and our temple flower garlands had turned limp in our hands, when the motorcade rolled in. Mr. Garcia stood on an open jeep as he floated through the throng the sun to his back—a small burnt-skinned man like an Ilocano. I supposed he had noticed my garland because he held out his hand to shake mine. Mama gave birth to my sister at 3 o’clock that morning. After the euphoria of shaking the president’s hand, I should have gone to Bacarra Clinic to see them both. But I passed by it concerned about how I reeked in my uniform. Next morning afraid of being late, I walked past the clinic again merely glancing through lacy clusters of banaba flowers at the second-floor windows. At our HE class Nana Idad, a sister of Dr. Albano and Senior Class adviser, came to see me as I gathered the apron I was sewing turned rag from a dozen re-dos in my clumsy hands. (Nana, mother in Ilocano, is also used to address elderly women kin.) She told me that my mother had been expecting me; everyone in the family—Doctora Pacing included—had thought that I felt jealous of the baby. I proved them wrong when on the afternoon of the next day after school I asked to be excused from our cleaning group. I turned over to our leader five red candles, a gin bottle of petroleum gas, and the tin can in which we melted the candles on a stove—three stones we planted on the ground under the main building. Once liquefied and poured over with petroleum gas, the candles became our floor wax. As I approached the clinic near the yellow bells climbing the walls across the clinic, I broke away from my friends, ran up the stairs my hands cold with anxiety and huffed toward the bed by the window. Mama was sitting up a bundle to her breast. My sister stopped sucking when I stood over her as if she knew who had come. How she met me was a sight I have not forgotten—marble eyes on a robust angel face a full head of fat curls framed. Her effect on me surprised my mother the most: one day I came home with a composition about it, which our English teacher gave a grade of 96. While my piece remained posted for a week on the bulletin board, its worth lightened beside an incident that had started to preoccupy me: someone inserted a love letter signed Lonely Heart in my assignment notebook. Disturbed by its declarations, I vowed to unmask the coward who wrote it and turned into a spy, picking suspects in class everyday. And then one day, someone spotted a comics-like cover among notebooks left on the steps of the HE building. We fussed over the thin volume of love letters—five of us reading the letters we got from five cowards, or was it from the same coward? We never knew. Then came the extremely cold year—the Siberian cold front that swept the Ilocos during our sophomore year, and which had sent us to school wrapped in knit sweaters and woolen coats, some too big for our size. It was also the year my seatmate and I witnessed with bare eyes how grass grows—a slight miracle at the softball field during the Monday flag-raising ceremony. its rays by the time we sang the National Anthem. Everyone seemed sluggish those cold mornings, including me. Still, I kept turning my head for someone to talk to or laugh with. That week’s emcee had just called one of the guys for a declamation piece when I noticed Elena smiling—she always had a serious mien. What puzzled me more was that her eyes were transfixed on the grass. Imitating her, I suddenly saw it! A blade moved: first, a quiver, and then an abrupt flick like the kick of a newborn. For the next two years, Elena and I those Monday mornings waited for the magical moment, half-minding the class trio’s growing repertoire of songs—a fixture in those morning’s programs—the last of which were “Volare” and “Fools Rush In”. We were seniors by then. Before we graduated, I won reluctantly a Silver Medal in an oratorical contest. Papa had come home for a long vacation shortly after I topped the school-wide competition to represent Bacarra High in the province-wide contest. Tata Milio talked him into writing an original piece for me—something on Jose Rizal’s (our national hero) thoughts on the youth, the contest theme. He did and he also coached me on delivery: I felt like I had been dipped into a crucible. I woke up nauseous from an acidic and nervous stomach everyday. I also had to give up my afternoon forays in the bushy northern edge of town to Lola Annit’s house—where I could pick as many purple star apple fruits as I wanted—to get home early for supper. After an hour or so, I would stand atop the stairs on our porch, a Coleman lamp flood-lighting our yard or the full moon washing my face to deliver my oration. My voice rang through a neighborhood of maternal cousins, aunts and uncles, grandaunts and granduncles who must have suffered through those evenings that lasted for three months. Two days before the contest, I practiced before an afternoon assembly in school, receiving a cymbal-applause that only upped my nervousness. Afraid I would disappoint Papa, I threw a tantrum and threatened to quit if he did not leave for Manila the day before the contest. Within three months, we faced the final exams but we were more excited about the Seniors Prom. Two rooms of the Main Building, its walls knocked down, became our dance hall. A generator that whirred by the stairs kept the hall lit and the music going. Most of the girls either giggled or sat frozen out of nervousness. I sailed on a cloud as pink as my empress cut dress, silver dust outlining the roses. No one came for me until the third piece. Just then, the first strings of “Fascination” floated, easing up the stifling air. I did not see him but before I knew it, he stood before me holding out a hand. His hands were clammy, and he held me rather loosely; it felt strange. I realized only then that it was the first time we touched even if we had known each other as children. That dance was to be our first and last. I went home only once during my college years on my first semester’s break; I had enrolled at the University of Santo Tomas in Manila for journalism. I returned just twice years later—first in 1974, to interview homecoming Hawayanos (town mates who sailed to Hawaii in the 1900s as sugar cane gatherers and pineapple pickers) for a magazine article; and in 1982, to attend the installation of my maternal grandfather’s monument—Ceferino Acosta—for his heroic deeds during WW II. My sister and I went back in 2002 for what perhaps could be the last time to turn over my paternal grandfather’s lot to the buyers; the family had decided to sell it. As the new owners and I talked, I would glance at the wild growth where once was a tomato patch I used to stray into, Lola’s hoarse cries stopping me, to pick red globules off the low-lying vines. The sun that morning swept through crowns of mango trees now slouched from age and neglect; I had often watched Ka Iban, who also grew the vegetables, trim its branches before the rains. Across the street where I used to lurk waif-like, nothing but a gaping space remained of my great grandfather’s stone house, the moat surrounding it and the stables he bred horses now mere tales—Don Benito Cab-caballo who traded his horses they say from Vigan to Pangasinan. 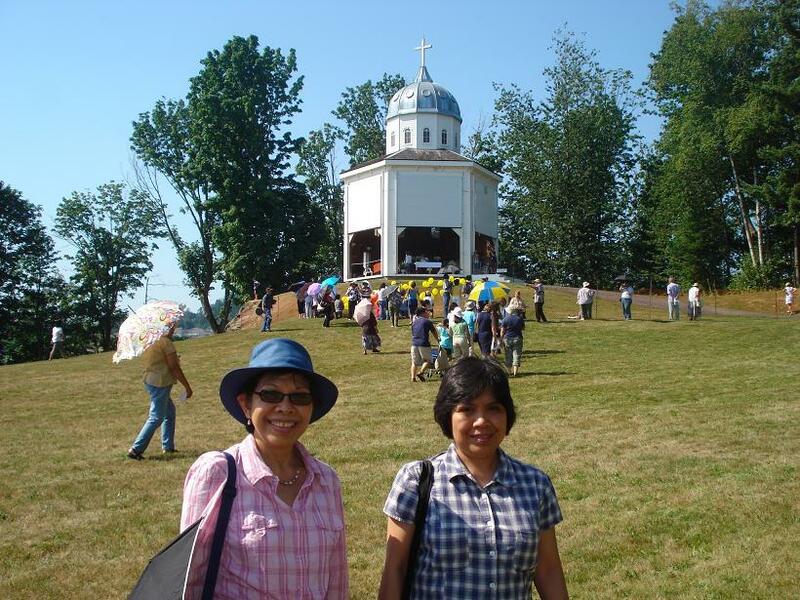 The town I knew had so changed by then: most of our kin had died; the Aligas, the Pilars and the Albanos with their complex web of cousins had left for Manila and the Americas and Europe. My sister and I long orphaned, had since migrated to Vancouver, BC, Canada. Is the past descending on us like a sudden storm? Recollections, memoirs, archives, monuments and biographies seem to have multiplied by degrees these past years as if people were scrambling to hoard memories. Is it merely a perception or perhaps, indeed, the world is spinning too fast we’re afraid we might just lose our histories soon? Some are lucky, like you, in that you still can tell your stories as juxtapositions of the past and the present. Or am I luckier because I’m telling my story from a vivid past discounting the changes I’ve noted in my few visits back home in Bacarra, Ilocos Norte? For instance, it was quite painful to see how that imposing fractured tower which loomed like a petrified giant all our lives has been reduced to a stump. But instead of groveling, which I first felt like doing, I wrote and I am still writing about my memories, even asking others to join in for a collective memoir. In history, Bacarra is apparently one of the most powerful towns in Ilocos as the Spaniards found it and early on in colonial times. 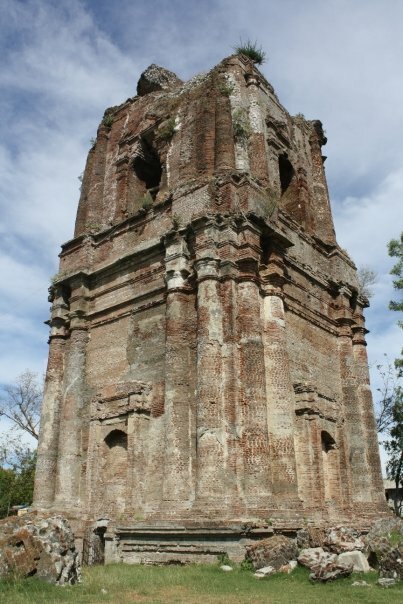 Neighboring towns like Vintar and Pasuquin, in fact, were part of it. (I know this for a fact, having read it in frayed documents.) Apparently, there was gold somewhere, as well, and its rivers were teeming. I once stumbled on a picture of our tower, in a blog and it unleashed images of childhood spent under its shadow. That tower loomed overwhlemingly in our lives in both reality and legend. No Bacarreno is without a treasure box. This is my favorite: Legend has it that its people reflected their pride in their town by constructing a tower so high it ‘could hold up the heavens’. It is said that a Spanish soldier on horseback, holding a pennant up could ascend the steps in the tower and wave the pennant from the second window. And when the bells were rung, it could be heard as far the edges of Pasuquin and Vintar. That the first earthquake sometime in the 1930s happened on the feast of St. Joseph, the humble patron of all churches, could have been a bold and loud message. I grew up toward the end of the first half of this century, going on to adulthood when the world began to slowly change. In my childhood, Bacarra was still an idyll—wildwoods still fringed a lot of places, darkness and moonlight still came as they should, not half-lit or half-black. We studied in the gas light, we played under full moons. My walk to school had since turned into something like a, ‘cartography of the heart’. I had not realized since I began charting my past how each detail, each small turn on the road, each tree and vine that climbed walls, events that were routines, that first love letter and first dance were so vivid it felt like looking at myself in a snow globe. In your recollection, I feel like I’ve known you though we may never meet: you could very well be one of my playmates who watched out for summer bees—those abal-abal and aruaros whose wings we used to tie with a thin thread like a leash and let fly, listening to the roar of their wings, cruelly without knowing it, tracing how they circle around searching for their freedom. Childhood, the past—aren’t we rich with a clear globe of innocence and glee? If there was some still-unfound-wind to wash out some of the gray sometimes black cloud hanging over our much-too-troubled days, your recollections and mine as well as a growing mass of others might yet be the magic wind. On Dec. 8, 1941, a war that has long been brewing on both sides of the hemisphere sundered the world apart. Cities have been ruined, some of them like Warsaw turned into ashes, cultures and histories lost forever like Intramuros, the old Manila. With the bombing of Pearl Harbor by the Japanese, the United States was drawn actively into a war already raging in Europe and Asia, and with it albeit reluctantly and innocently, the Philippines. Life for most families in the Philippines changed forever—like my family, my mother’s family—as neighbors and friends, too, switched loyalties. 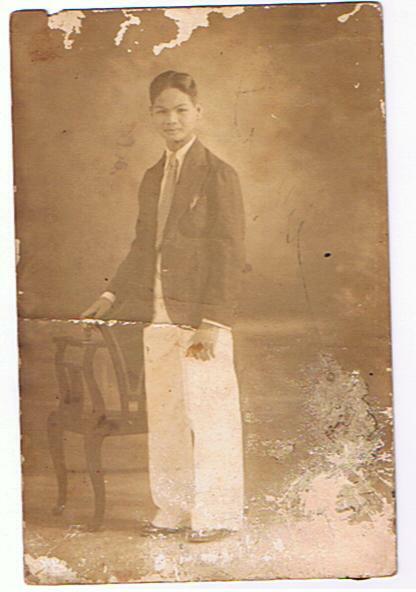 My grandfather Ceferino R. Acosta, was arrested by the Japanese in a hidden barrio in Bacarra, where he evacuated his family from Laoag; he was then a US army lieutenant (reserve). Forced to reveal the guerilla roster led by then Roque Ablan, Sr. of which my grandfather refused, he was incarcerated and later executed. The circumstances of his death were not confirmed as was Ablan’s whereabouts after he disappeared. No corpus of my grandfather was ever found. The youngest of his 9 children had hardly turned a year old. One of his sons saw him shaved on a last visit to his prison cell at the provincial capitol in Laoag—he and his grandmother, my grandfather’s mother, had walked all the way from Bacarra. This son had witnessed how the prison guard turned over my grandfather’s sleeping mat, blanket, and the book he was reading, Thomas a Kempis” “Imitation of Christ”. Another son, the eldest of four boys, had claimed to have seen him wave from a truck where prisoners were packed for transfer. Both sons although they hardly talked about it could hardly amount to anything and seemed to have been lost forever. For the first time before he died, the elder son one day took out a story written in a national magazine, which he had kept without ever mentioning it, and told his daughter that she must let her son, read it someday. I grew up under a heavy pall of sadness around the family that dissipated as the children, my mother, my aunts and uncles, scrambled for survival even attaining peace, but the shadow of an absence that hovered around in their lives didn’t completely fade. From snatches of their stories, I composed this poem. For a corpus never came up no matter the asking around. that ruined placid lives like theirs. train tracks on to race. they were never to enter again. 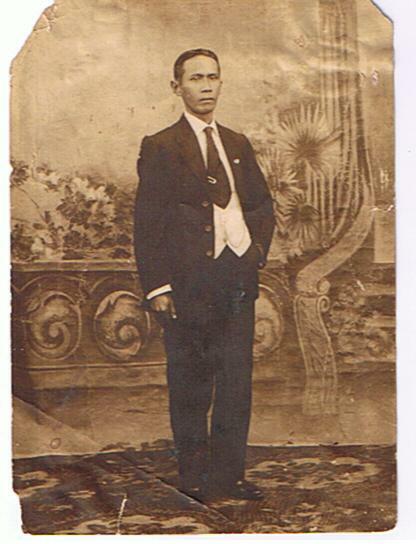 *Tatang–meaning father as used by Pampangos curiously borrowed by my mother, aunts and uncles, instead of Tata in Iluko. It must have been borrowed from children in their neighborhood in then Ft. McKinley, Guadalupe, Manila where the older children with my mother as the eldest grew up. They also called my grandmother Inay the Tagalog term for mother instead of Nana in Iluko.